In the shimmering heat of summer, the spikes of Watsonia schlechteri appear as beacons amongst the fynbos. Often producing a single spike of up to 30 large trumpet-shaped lurid orange-scarlet flowers, the individual plants can be spotted from considerable distance across the mountain slopes. While this certainly attracts the attention of the mountain hiker, its main purpose is to draw in the scarce pollinators that are around at this time of year. Both the Mountain Pride Butterfly, Aeropetes tulbaghia, and sunbirds, such as the Malachite and Orange-breasted Sunbirds, are attracted by the strong colour and long-tubed flowers, which provide a good nectar source. 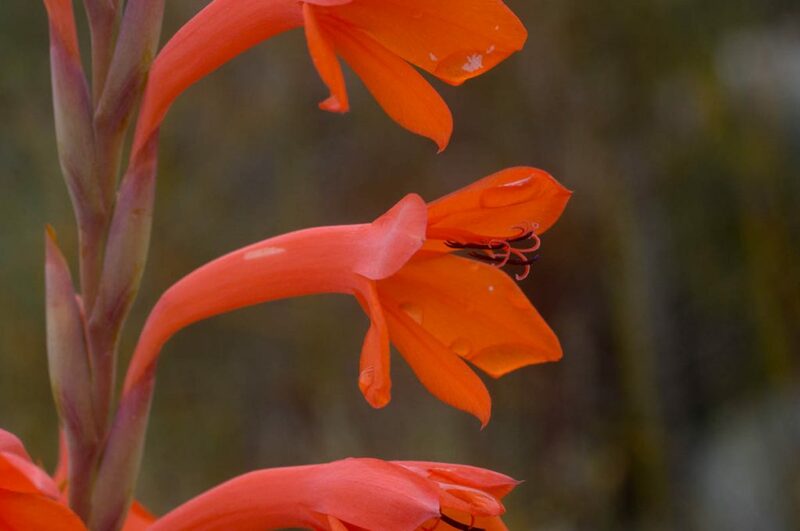 Watsonia schlechteri is easily identified amongst the Watsonia of the Klein River Mountains because of its summer flowering habit. The other species have finished their flowering by December but Watsonia schlechteri starts around then and continues on into February. It is also unusual in that it grows on dry rocky slopes, frequently amongst rocky outcrops, where its corms are protected from predation by baboons or porcupine. In such confined spaces, it rarely forms large clumps, like many of the other species, and produces just a single flowering spike per plant. Other key characters include the leaves, are narrow, less than 1.5cm across, with thickened margins, and the flowers have long bracts, which enclose the lower part of the tube. The upper tube of the flowers, above the bend, is up to 3cm long before it flares into 6 broad (1.2-1.5cm wide) petals, which are held more or less vertically. The colour is bright orange to almost red. The colour is so intense that when photographing it, the detail can easily be lost. Watsonia schlechteri flower, showing the bracts that encompass most of the tube below the bend. 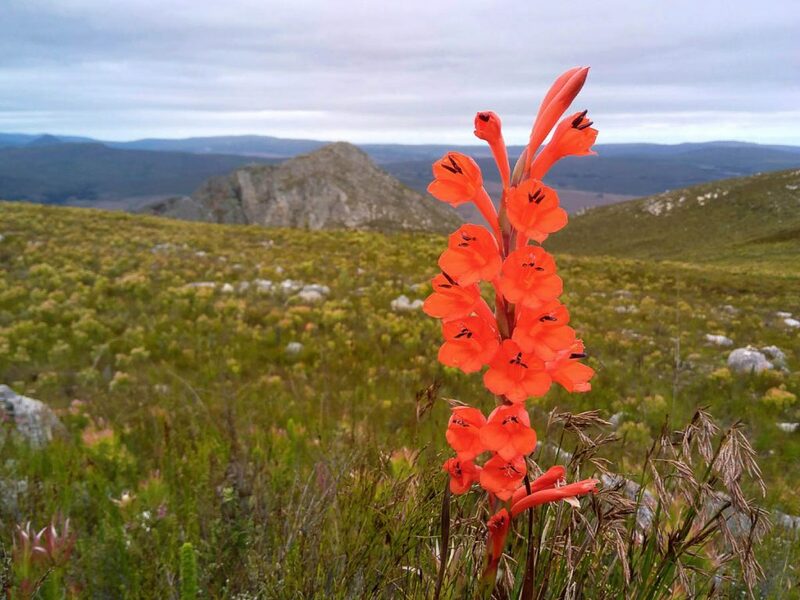 Watsonia schlechteri is common on the Cape mountains, particularly in the west (but absent from the Cape Peninsula). 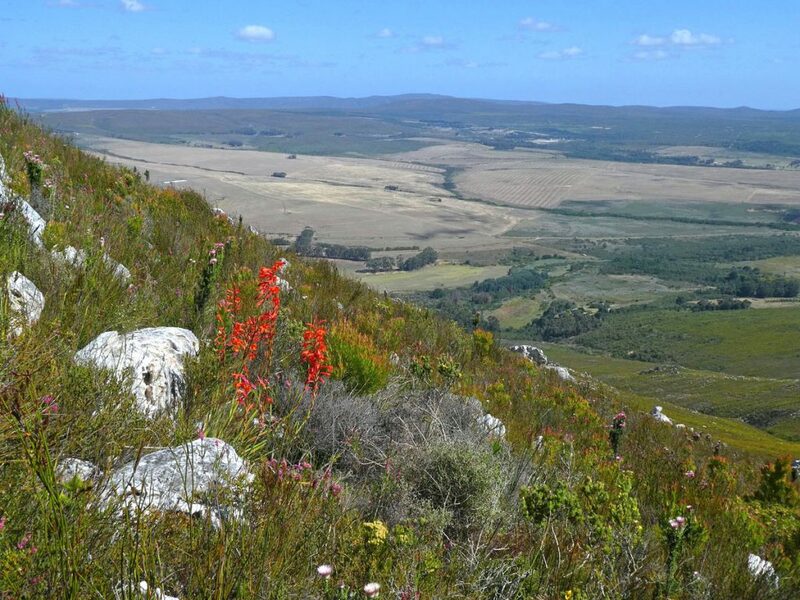 It is found from Ceres in the north, to Kouga Mountains in the Eastern Cape. While high mountain slopes are its preferred habitat, it can be found in the foothills in the south of its range. Flowering at its best just after a fire, the plants will nevertheless continue to flower in mature veld, providing it is short enough (lower than 1m). At Phillipskop it is found scattered throughout the reserve but best observed on the Rock Stacks Hiking Trail. It should make a good garden plant for a water-wise garden as it flowers in summer even without irrigation. As it does not produce clumps so readily as other Watsonia species, it is best propagated by seed. December, February, geophyte, Iridaceae, January, summer, sunbird, Watsonia. Bookmark.